You have come to the conclusion that you want to add a water feature to your backyard but are now faced with some question marks. What pond types are available? What is best for me? How much construction is needed for each pond type? These are all valid questions, and many of these are being asked by millions of people all over the world as you read this. You will be surprised to hear that the answers to these questions are quiet simple, and once you have laid the ground work for your pond project, it will run smoother than you had ever imagined. Before deciding what pond pumps and pond filters are on the market, you should be aware that, for the backyard hobbyist, do-it-yourselfer, or water gardening enthusiast, you are really only looking at two, rarely three pond type options: preformed ponds, pond liners/liner ponds, and concrete ponds. Concrete ponds being the rare third choice; this option is available but with concrete follows high labor costs, an extended construction period, and excessive repair bills. For the purpose of this article, focus will stay on the preformed and liner options. What are preformed ponds? These ponds have static shapes and dimensions from Day 1. 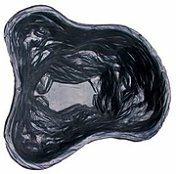 Usually manufactured from a plastic/rubber composite material, these ponds are molded into various shapes. Depending on the look you are going for, ponds are now made in square or rectangular shapes, organic/natural shapes, ovals, and so on. Almost any shape pond you can dream of is now made somewhere in the world, each one having its own depth and size attributes. Along with shape, many companies now offer various colors and textures as well. Preformed ponds fit into two major categories: preformed and folding. The major difference between the two is the transportation issues that are found when shipping these large containers. Folding preformed ponds are typically small enough to fit into the trunk of a small car whereas regular preformed ponds have a static size and can be fairly large. Early versions of the folding pond concept were not very durable and prone to cracking. Since then, advancement in the composite material used on these garden ponds has increased, making these ponds highly durable and weather resistant from 0 degrees F to 105 degrees F.
High quality preformed ponds have unique textured ridges incorporated into the design. These ridges allow for the growth of bacterial colonies. This bacteria is necessary in controlling algae growth and steadying the natural eco-system the pond will develop. These ridges simulate the natural landscape; natural ponds don't have smooth surfaces, they have rough channels, muddy pockets, and un-even embankments. To help you choose between these two options: the folding pond comes in a smaller box, thus, saving money on shipping costs or possibly fitting into your car while regular preformed ponds are very durable, and, if shipping costs or transportation aren't an issue, this pond is perfect for you! Liner ponds, liner kits, and pond liners, basically all relate to the same end result which is a pond with a liner to retain the water. Now these ponds are not to be taken too lightly; more planning and excavation detail are needed for this type of pond. A preformed pond simulates a natural landscape by adding ridges and shelves; this can be achieved in a liner pond but it has to be done manually or by machine. These ridges or shelves are essential for the maturity of plant and fish life and the balance of the ponds eco-system. Dimensions and depths need to be addressed well before the construction stage begins. It is important to note that liner ponds do take more work for excavation and planning. So what are pond liners made of? Typically these liners consist of a synthetic rubber which is highly durable, flexible, and water/weather resistant. Most liners need little to no maintenance, and, if a repair is required, many patch kits are available. One very appealing factor of the liner pond is the creative freedom this pond provides. With preformed ponds, the shape is static, what you see is what you get. A liner pond, on the other hand, is a blank canvas allowing the installer to really plan and develop the pond into something original. This pond type appeals to people who don't want restraints and want to be able to curve, bend, and warp their pond any way they like. Liner ponds are also used for large scale applications such as golf courses, shopping malls, and housing developments where thousands of gallons of water will be used. For these size jobs, a preformed pond wouldn't be possible. Prior to making your final choice regarding pond type, compare the two; estimate the total cost, man power/labor, your time, backyard size, and the amount of creativity and planning needed to complete the project. Lastly, weigh the options available, do your research, and from there decide what pond if the best fit for you and your family.